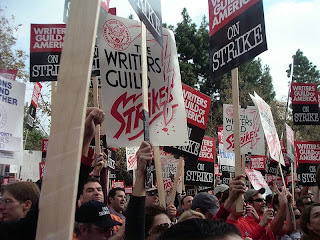 The 2007–08 Writers Guild of America strike is a strike by the Writers Guild of America, East (WGAE) and the Writers Guild of America, West (WGAW) that started on November 5, 2007. The WGAE and WGAW are two labor unions representing film, television and radio writers working in the United States. The strike is against the Alliance of Motion Picture and Television Producers (AMPTP), a trade organization representing the interests of American film and television producers. Over 12,000 writers joined the strike. The Writers Guild has indicated their industrial action would be a "marathon". AMPTP negotiator Nick Counter has indicated negotiations would not resume as long as strike action continues, stating, "We're not going to negotiate with a gun to our heads—that's just stupid."